Since the introduction of the 991.2 Porsche 911 GT3, the top spec RS model has lacked a bit of flavor to justify the significant price hike. 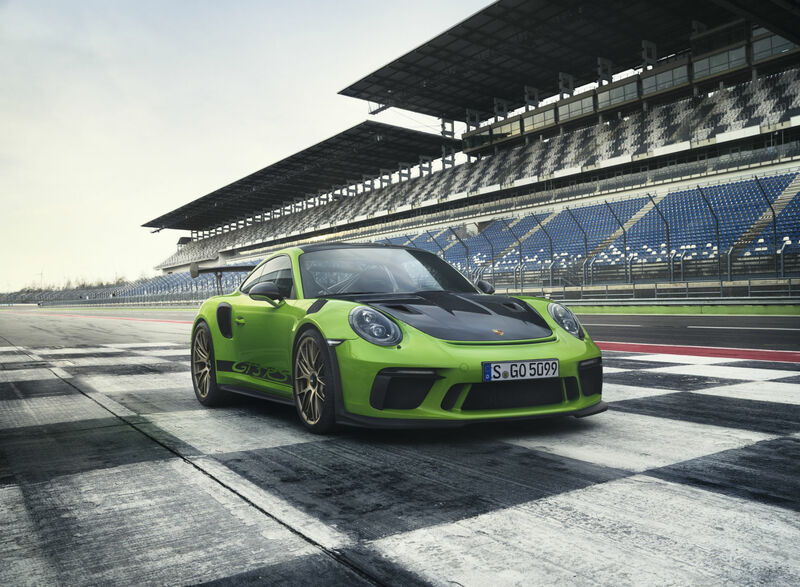 Both models were tied at 500 horsepower and lap/acceleration times were eerily close, making the GT3 RS a headscratcher in terms of value versus price. Porsche knew that and, as it turns out, had something brewing all along in developing the new naturally aspirated Rennsport version of the now-current generation 911. Porsche has built off of the outgoing model and massaged it for better performance in each segment. Perhaps most notable is the 20 horsepower bump that increases the output of the GT3 RS to 520 hp and 346 pound-feet, making it the most powerful naturally aspirated 911 of all. This, in turn, helps boost the Porsche's 0-60 mile per hour time to 3.0 seconds when equipped with the seven-speed PDK transmission, the only available gearbox for the RS. The underpinnings of the 2019 model are tweaked from the 991.1, albeit with similar hardware. 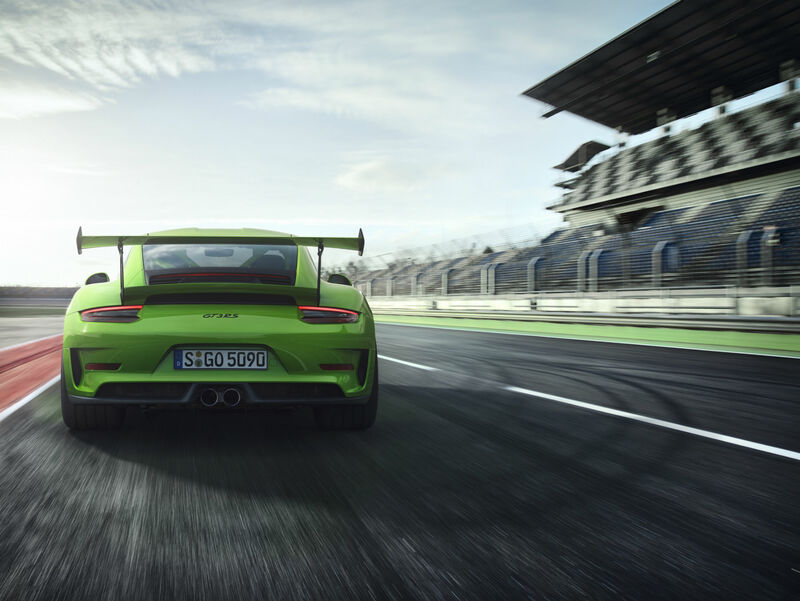 Rear-wheel steering makes a return with marginal adjustments for increased performance and Porsche's full suite of active suspension tech makes it increasingly quicker than the previous generation. Both of these features are standard, as are active engine mounts and a fully variable electronic rear diff. All of this trick equipment's effectiveness is transferred to the track via 21-inch by 12.5-inch rear wheels wrapped in massively-wide 325/30 tires. The fronts are staggered to 20-inch by 9.5-inch with 265/35 rubbers, covering the 380-millimeter brakes at all four corners. An all-around upsize is available with Porsche's Ceramic Composite Brake system which offers 410-millimeter front brakes and 390-millimeter rears. Collectively, all of these features are wrapped in extreme aero that helps the RS produce twice the downforce of the current GT3 at 124 miles per hour. The Porsche's front end and hood display the most obvious changes for this model year with NACA ducts incorporated into the design to promote quicker, more efficient brake cooling. The familiar front splitter and wheel arch vents also make a comeback, allowing for better aerodynamic properties where it matters most. A delectable assortment of materials makes up the GT3 RS' body panels including ultra lightweight polyurethane front and rear fascias, a carbon fiber decklid, and magnesium roof. These bits and pieces help shave overall weight to around 3,200 pounds in standard trim. However, as Porsche has made clear in the past, there are always more options. The priciest and arguably most effective of the lot is the Weissach Package. Weight saving measures are taken even further by converting the front and rear sway bars and coupling rods, roof, steering wheel trim, and shift paddles to carbon fiber. When ordered alongside the optional lightened magnesium wheels, the total weight of the GT3 RS is slashed to 3,153 pounds. This all comes at a price, as you'd expect. The standard version will have a base MSRP of $187,500 which does not include the $1,050 delivery fee—and it only goes up from there. The aforementioned Weissach Package tacks on an additional $18,000 and, if you want those magnesium wheels, that'll be an extra $13,000. When taking personalization costs into account, the new GT3 RS can easily break $200,000. We'll see the new Porsche in person for the first time at the Geneva Motor Show in March with examples popping up in dealerships come fall 2018. It will be used for multiple electric models beginning in 2021.